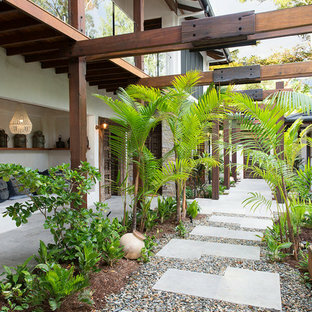 This is an example of a tropical front yard garden in Cairns with a garden path. Inspiration for a small asian garden in London. 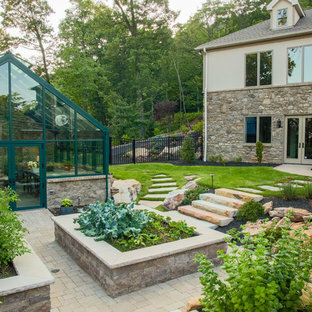 PA Landscape Group INC Project Entry: Mountainside Living 2014 PLNA Awards for Landscape Excellence Winner Category: Hardscaping-Residential $120,000&over Award Level: Silver Photo Description: This residence sits on a mountain side, sloping wooded property. Water was an issue flowing down the mountain, so many rocked swales divert the flow. The area which we are presenting is the rear of the house that will be used to entertain family and friends, a place to unwind in the evenings and weekends. 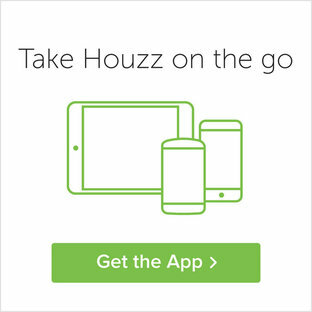 We designed the outdoor areas to meet the needs and desires of the owners. When one walks through the breezeway not only to see an expansive valley view, but a relaxing fireplace and living area below where relaxing begins. Walk down the stairway of natural cut stone, you wonder through a landscaped garden onto the living area patio. Looking to your left is the pool with ample hardscape pool deck; large enough for a party or just the intimacy of two. Separating, yet joining the two areas is the grilling island, bar and outdoor wood burning oven. On the other side of the living area we go down a few steps to the raised planters and conservatory/greenhouse where plant are enjoyed from seedling to flower, or one can read a good book. Each area has it’s own personality for conversation or contemplation. The area is surrounded with plantings to provide color or to silhouette on the gray winter sky. 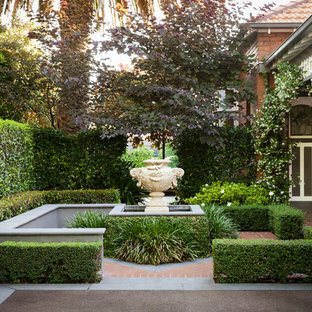 Photo of a mid-sized traditional front yard garden in Melbourne with a water feature. 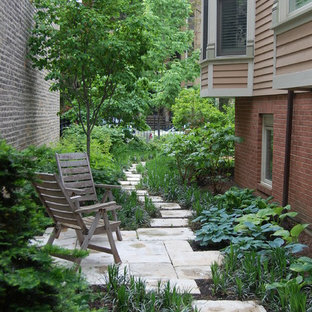 This is an example of a mid-sized traditional side yard shaded garden in Chicago. 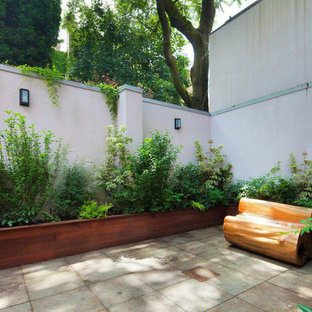 This Brooklyn Heights townhouse backyard features a bluestone patio and custom-built ipe wood planter boxes. The quiet, Zen-like backyard is shaded by surrounding buildings, so we picked a shade-tolerant mix of dogwoods, rose-of-sharons, rhododendrons, and Japanese andromedas to plant here. It features a bench carved from a tree trunk. When choosing plants that will do well in shade, I find it's generally helpful to think about the types of plants that do well in a woodland environment. Read more about our projects on my blog at www.amberfreda.com. 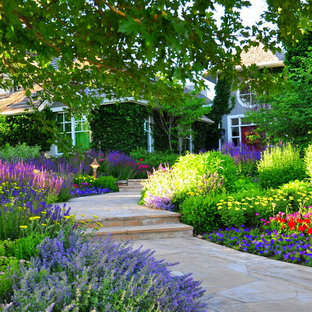 Design ideas for a traditional front yard partial sun garden for summer in Denver. 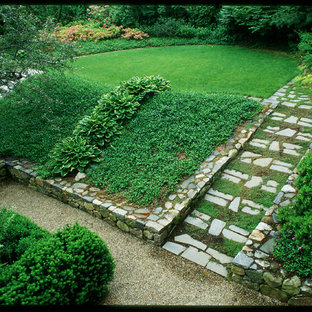 Photo of a traditional sloped shaded garden in Boston. 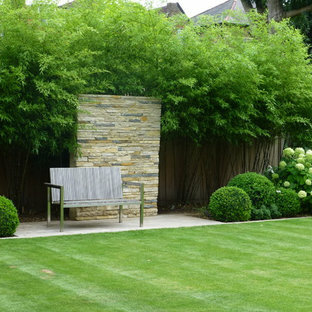 Photo of a contemporary backyard garden in London. Design ideas for a contemporary garden in Orange County with a vertical garden. This is an example of a small tropical backyard formal garden in Melbourne with decking and a retaining wall. This is an example of a large traditional backyard full sun formal garden for spring in Philadelphia with a container garden and natural stone pavers. Inspiration for a mid-sized contemporary rooftop partial sun garden in Delhi with concrete pavers. Photo of a large asian backyard formal garden in Other with a garden path and natural stone pavers. 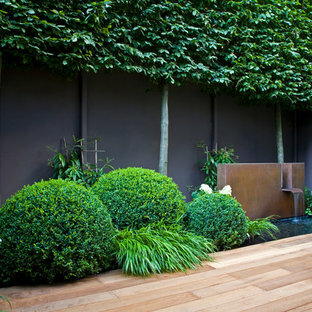 This is an example of a small contemporary formal garden in Melbourne with concrete pavers. Contemporary front yard garden in San Diego. Expansive mediterranean sloped garden in San Francisco for spring. This is an example of a traditional outdoor sport court in Vancouver.